Southern Africa’s most endangered large carnivore and one of the most endangered carnivore species in the world, the Wild Dog, is the flagship species of the Carnivore Conservation Group. The Wild Dog has been the focus of a major long-term study programme in the Kruger National Park since 1989, sponsored by the Endangered Wildlife Trust. The Kruger National Park contains the only viable South African population of Wild Dogs. Information and knowledge gained from this study has been used to improve management strategies for the species. This population has fluctuated significantly during this time ranging from less than 200 animals to approximately 400. Impala, the major prey species of the Wild Dog provide adequate food for adults and their pups. Make a secure online donation to the Endangered Wildlife Trust. They are also grateful for other kinds of support such as sponsorship and wills, and you can learn more about this on their Support page. The Wild Dog is a highly social species that lives in packs. Normally only the alpha male and female breed and other pack members help to raise the pups. The packs inhabit large areas of 400 – 900 square kilometers in the Kruger National Park. Attempts are being made to improve the Wild Dog population in South Africa by introducing the dogs into other reserves and to managing these sub-populations as a single meta-population. In 1997, a PHVA (Population and Habitat Viability Assessment) for the conservation of Wild Dogs was held in Pretoria and the Wild Dog Advisory Group (WAG) was formed as a result of this workshop. 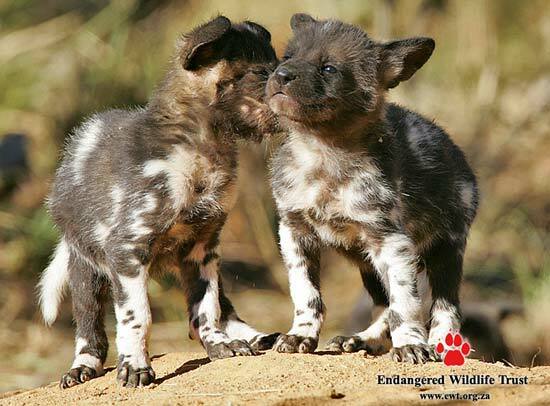 WAG’s major objective is the establishment of a second viable Wild Dog population. This is an ongoing effort. The Wild Dog is South Africa’s most endangered large carnivore. The total Wild Dog population in Africa is only between 3000 – 5000 individuals. Wild Dogs are considered to be extinct in 23 countries in Africa. Wild Dogs are particularly susceptible to snares and road kills. In natural areas the lion is the Wild Dog’s main enemy and competitor. A Wild Dog uses up twice as much energy as a working Border Collie. Funding of the project: As is the case with most of the wildlife research projects this wild dog conservation programme is underfunded. The wild dog research project relies heavilly on gifts for their funding. Without funding this research project cannot continue which would be a major blow to the survival chances of the wild dogs in the wild. Please support the Hluhluwe/Imfolozi wild dog research project by making a donation to it. Any donations are most welcome and needed. For more information, visit the Endangered Wildlife Trust site.